A shape that has become a symbol of progress and innovation, a floating blimp attracts attention and captivates our imaginations. Designed for indoor use, these graceful blimps can fly over sporting events, trade shows and sales events. A portable and reusable display that can be ready to fly in minutes. Ranging from 10' to 20' in length, the remote-controlled blimps that are 10' and larger include a "prize drop" feature that allows prizes to be dropped on the crowd, creating a new level of excitement. Two separate drops can be made before refilling the payload. The system includes dual strobe lights on the sides of the gondola for a realistic effect. Imagine the crowd as they realize prizes are falling from the sky! They are sure to form an instant and loyal bond with the logo that is creating all the fun! 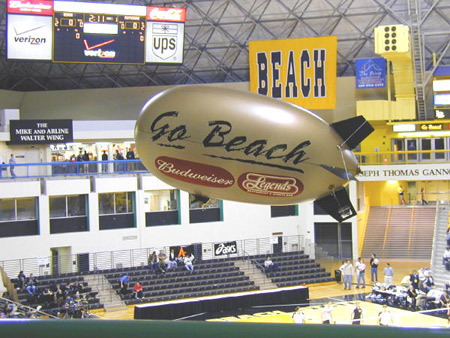 The remote-controlled blimps are available in sizes from 10' to 24' in length. The 10' and 20' sized blimps are made from 11 - 18 mil PVC with foam core tailfins. These blimps are more powerful and include the prize-drop feature with lit gondola (see photo, right). 27 colors are available for the body with 24 tailfin colors to choose from. Artwork is digitally applied using a flexible urethane based paint that will not peel or wrinkle. See pricing below. These remote-controlled blimps come as a complete kit, all you need is the helium. Since laws do not permit shipment of helium tanks, it is the only component that you will need to supply locally, everything else you'll need is included in the kit. Helium tank delivery is easy to set up with one phone call and is widely available throughout the USA. 4 Channel Remote Controller and Receiver, 1500ft.+ Range. 1W-REMT10 10' Remote-Controlled Blimp & Kit $2,370.00 $2,550.00 $2915.00 245 c.f. 0.5 LBS 18 lbs. 1W-REMT15 15' Remote-Controlled Blimp & Kit $3,094.00 $3,279.00 $3,765.00 410 c.f. 2 LBS 26 lbs. 1W-REMT20 20' Remote-Controlled Blimp & Kit $3,827.00 $4,008.00 $4,555.00 700 c.f. 6 LBS 35 lbs.